If eating more fruits and vegetables is this easy and delicious, I don’t know why I waited so long. Try this recipe…and you may want to eat all four servings yourself! My family thinks cauliflower prepared this way tastes like popcorn, onion rings, and french fries. Directions: Preheat oven to 425 degrees. 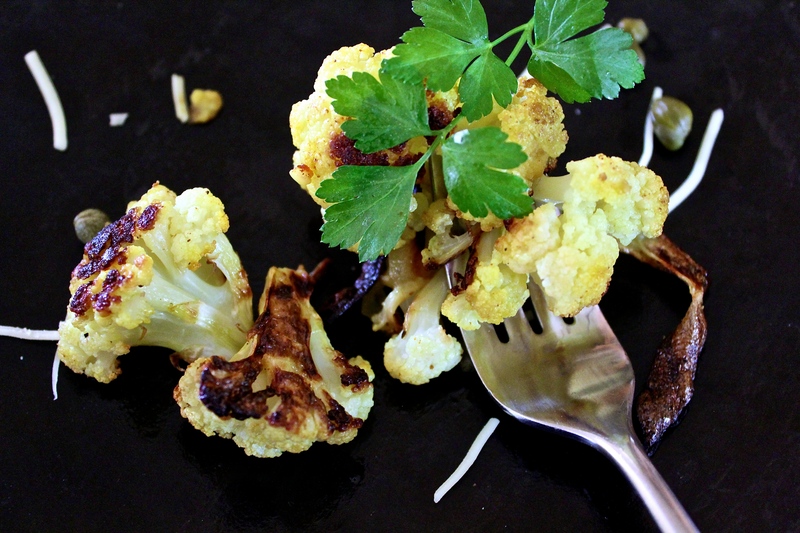 Toss the cauliflower, onion, oil, salt, pepper, and turmeric together on a baking sheet. Roast for 10 minutes. Remove and add the garlic and capers. Return to the oven and roast until golden brown, or approximately 20 minutes. Remove from oven and add parmesan cheese and fresh parsley. Notes From Day 1/365 :: I might have been over zealous on the first day. My fruit and vegetable serving count was ten, which is double my daily goal. One interesting pattern I noticed is that I eat all of my fruit in the morning and all of my vegetables in the evening – without much in between. How about you? Did you enjoy your daily five? Do you give your body the nutrients it needs all at once, or throughout the day? I would love to know!